Assamese version of Adhbut Ramayan, written around 500 years ago, is a retelling of the Valmiki Ramayan. 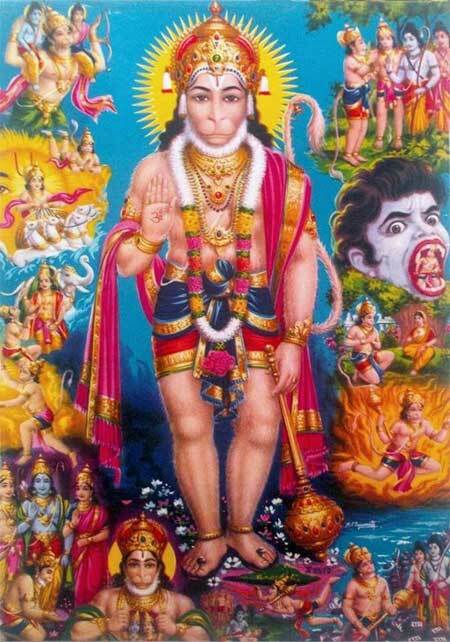 In it, there is an episode of Hanuman rescuing Luv and Kush, the sons of Mata Sita and Bhagavan Sri Ram. This rescue act is a retelling of the last chapters of the Uttara Kanda of Ramayan. The tory takes place after Mata Sita had entered earth. She misses her sons and she takes the help of Snake Vasuki, who is the ruler of naga kingdom, which is beneath the earth as per Hindu scriptures. Luv and Kush are kidnapped by Snake Vasuki. Hanuman goes in search of Luv and Kush. He leaves earth and enters the netherworld and from there to the world of Nagas – Nagaloka. A huge battle ensues between Hanuman and Nagas. There were no victors in the battle. Finally, on the advice of Mata Sita, a compromise is reached to end the battle. The children are allowed to go with Hanuman to earth. Mata Sita promises to visit her children and Bhagavan Sri Ram secretly. Hanuman thus rescues Luv and Kush and he reunites Mata Sita and Bhagavan Sri Ram.